I’ll get it out of the way at the start. Many other people have said it, but they’re all right. The new Bat for Lashes album sounds like Kate Bush. It does. There’s just no denying it. But as you should know, everything Kate Bush has ever done has been great, so similarly, the second album from Natasha Khan is just as great. Opener ‘Glass’ shows this more than most. It’s ethereal and beautiful, like a lot of Aerial or anything on The Whole Story. Another apt comparison would be to Tori Amos. ‘Sleep Alone’ is like one of the more outlandish Tori tunes (see her earlier work rather than the last few albums). Its percussive melody is beautifully matched by soaring vocals. ‘Peace of Mind’ and ‘Siren Song’ are other tracks that could be in the Amos canon. The sparse piano on both is beautifully interlinked with Khan’s glorious vocal. There are many standout tracks on this album (the sign of a classic-in-waiting), the first of which is the excellent ‘Moon and Moon’. Its endlessly captivating and instantly alluring. Single ‘Daniel’ immediately follows this, and has garnered many Fleetwood Mac comparisons. But don’t let the cheese factor of that put you off, this is like the Mac at their finest. It’s the chorus that sounds like a Stevie Nicks refrain, with the repeated strains of “Daniel” echoing in your head long after the song is over. ‘Pearl’s Dream’ takes from Amos and Bush and melds it all into one fantastic whole. On first listen it’s difficult to understand the vocals, but further investigation only adds to the beauty. ‘Travelling Woman’ stops just short of being a radio-friendly pop tune, and is all the better for it. It could sell out, but with Khan you never think she will, and she definitely doesn’t need to. 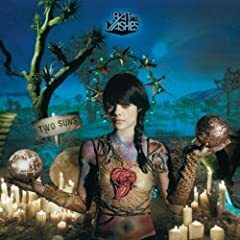 All in all, this is more than an equal for Bat for Lashes’ debut Fur and Gold/ It improves on the first album, by moving further into deep waters and exploring the more interesting elements of her songwriting. In doing so, she has not alienated her fans, but instead made a beautiful record than everyone should hear.